What can I do with ASA2? Where to register for the Amazon Associates program? Where is my tracking ID? Why to use the Repo? Where to find the feeds? Because product rating stars are not supported by the Amazon Product Advertisment API, ASA2 tries to provide access to this data. Product rating stars are not supported by the Amazon Product Advertisment API! The technical ways to access the product rating data may change over time, so ASA2‘s ratings feature can not be guaranteed. If you experience empty rating stars on your site although the product has ratings, it is very likely that ASA2 ran into the captcha on the product ratings site. By default, ASA2 reads the ratings from that page every time the product gets refreshed via the API. If you have many products on a page which have to be refreshed or you are using the serverside cronjob (Repo items refresh), the ratings page will get accessed many times in a short time. Sooner or later this will lead to running into a captcha and thus ASA2 will not get access to the data. 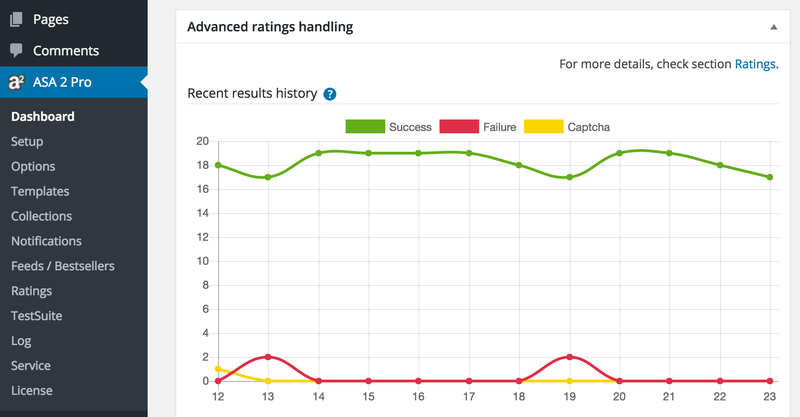 Since version 1.6, ASA2 features the advanced ratings handling mode. You can activate it on the options page in sections “Ratings” (see Advanced mode). Please note that after switching to the advanced mode, it will take some time until you will see the first results! 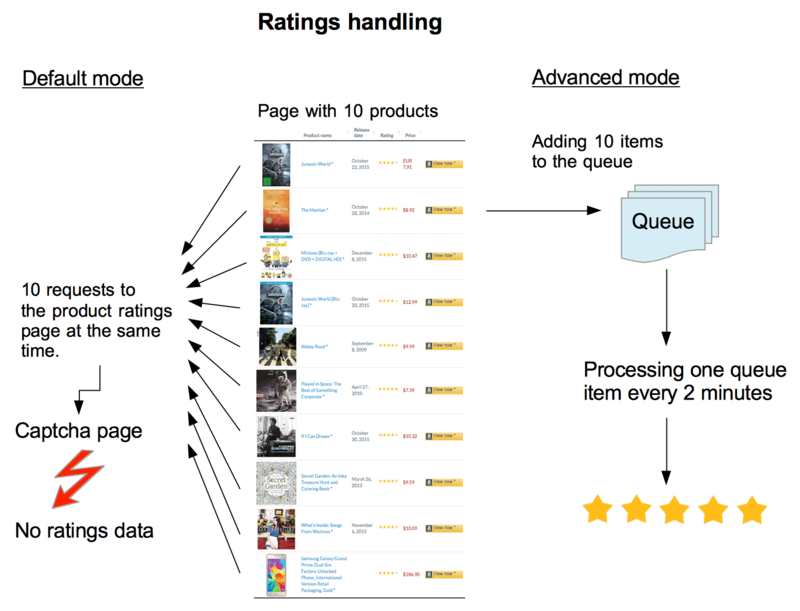 When it is active, ratings will not be refreshed with every product data refresh, but being transfered to a queue. This queue gets processed via an own cronjob or via the WordPress cron API. The frequency can be configured. This way, the amount of product page accesses can be controlled and the captcha will not apply. In advanced mode, requests for product ratings will be added to a queue instead of being processed immediately. When the ASA2 Repo is being used, all Repo items will be added to the queue. Once the queue contains items, controlled processing can start. To ensure the interval between the requests to the product ratings page, there is option Refresh lock duration. The minimum possible interval is one minute. Experience has shown that even with a one minute request interval, the captcha page may occur. The recommended and default request interval is three minutes. It supports all WP Cron API recurrences, which can be managed with plugins like WP Crontrol. Those depend on visitors requesting your pages. If your site does not have a visitor in hour, there will no rating being processed. Therefore the server side cronjob Ratings refresh is recommended. If you use it, set option Refresh recurrence to “Never / Server side cronjob”. It is recommended to use the server side cronjob to refresh the ratings. See Ratings refresh for more details. When using the advanced ratings handling, ASA2‘s dashboard will show an additional metabox with statistics. Line chart “Recent results history” shows the development of ratings queue processing of the last 12 hours. With this option active, ASA2 checks the amount of captcha results per hours. If it exceeds the successful results over a period of 12 hours, your site is blocked for requests to the product ratings page and ASA2 will automatically set a refresh lock duration of 12 hours. Experience shows that after this time, a site is not blocked any more. It is recommended to use the option “Automatic monitoring”.